Monday morning, the alarm goes off and you roll over in bed to turn it off. Suddenly the world does a 360, alarmed by the spinning you lie still for a moment waiting for it to stop. When it does you roll back and the world goes for another spin. What is happening? This scenario is typical of a problem called Benign Paroxysmal Positional Vertigo or BPPV for short. This is a condition that occurs in our inner ears. The inner ears are the structures inside our head that sense both sound and head position. It is composed of two parts the cochlea, which looks like a sea shell and the labyrinth, which has three semi-circular canals. 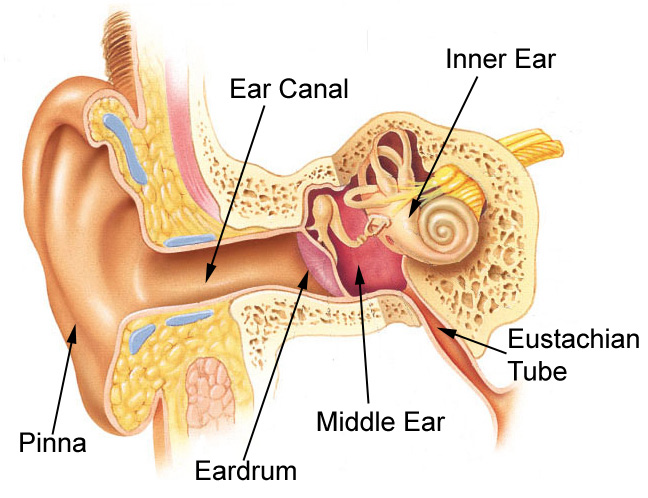 The outer ear is composed of the pinna and ear canal; sound waves are channeled through here to the ear drum. The sound waves get the ear drum vibrating and this vibration passes through the inner ear via three small bones call osicles to the inner ear. From here the vibrations travel to the cochlear and nerves are activated that send a signal to our brain that is perceived as sound. The other part of the inner ear, the labyrinth, has three semi-circular canals oriented in the three planes of motion: up/down, rotation, and lateral side to side tilt. They connect to a main body called the otolith. These canals are filled with a thick fluid that moves when we move our heads. The movement of the fluid activates small nerve cells in the canals that look like little hairs. These nerve cells then send a signal to the balance center in the brain to tell it what position the head is in space. In the vestibule part of the labyrinth are small calcium carbonate crystals called canaliths. They are supposed to be there but sometimes they get out of the vestibule and start floating around in the semi-circular canals. This causes a problem because now when you bend your head or roll over the two inner ears are not sending equal and opposite information to the brain. In the canal with the crystals floating around once the head movement stops the crystals are still moving. This creates flow in the inner ear fluid and the signal to the brain from this inner is that the head is still moving. The other inner ear tells the brain movement has stopped. This creates the sensation of spinning. This spinning sensation is true vertigo. While the symptoms are alarming the good news is that this condition is easily treated. A qualified vestibular therapist can accurately assess the condition to determine if BPPV is indeed the cause of the dizziness. Treatment then involves performing a series of head movements to move the crystals through the canal and back into the vestibule where they belong. We call these maneuvers canalith repositioning maneuvers (CRM). The most well known of these maneuvers is called the Epley maneuver after Dr. John Epley who created it in 1980. However, this maneuver typically only treats the condition if the crystals are floating in the posterior canal. There are over 12 different maneuvers that can be performed to treat all the possible forms of BPPV. A qualified vestibular physiotherapist can determine which one will work for you. Treatment is up to 90% effective within 3 sessions so don’t wait around for this to just go away. Great treated and get back to your life.